The weather is changing and winter is in the air. For me, that spells the beginning of soup season. I used to start Thanksgiving dinner with pumpkin or butternut squash soup. As the crowd grew, and the accompanying extra dishes grew, I pulled back. 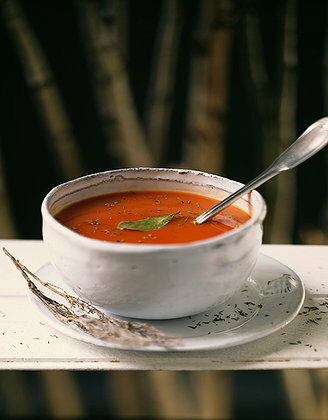 This year, I am craving a warm start to the meal, and this soup fills the bill. I will serve it in teacups, to prevent everyone from filling up before the main event! Although the “unrecipe” calls for butternut squash, feel free to substitute fresh pumpkin. Finely chop the white and light green part of one leek, and saute it in butter or olive oil, until softened but not browned. Add 3-4 pounds of butternut squash, peeled and cubed*, 1/4 teaspoon nutmeg, 2 tablespoons of curry powder, and 2 tablespoon of cumin, and continue to stir for a few minutes to allow the ingredients to merge. Season with salt and black pepper. Add a few tablespoons of Sherry, and cook long enough for it to evaporate into the mixture. Add about 4 cups of chicken or vegetable stock, (enough to fully cover the squash), and bring to a boil. Reduce heat and simmer, covered, for about 20 minutes until the squash is soft. Puree the soup in a blender, or use an immersion blender until smooth. Add more stock if the soup is getting too thick. Taste, and correct seasonings if necessary. Stir in a little more Sherry if desired, when ready to serve. Serve with a dollop of creme fraiche and enjoy! * many specialty food markets, such as Whole Foods and Trader Joe’s have already peeled and cubed butternut squash, which makes this much easier to make!